An animal rights group on campus received positive responses from a video that highlighted animal abuse on farms by challenging students into adopting a vegan lifestyle Tuesday. 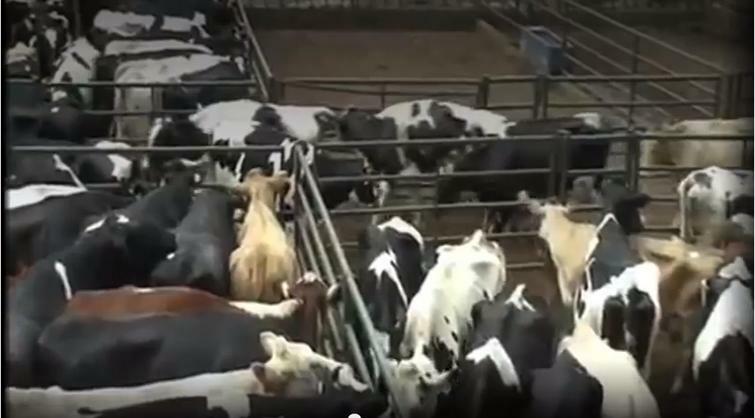 The Farm Animal Rights Movement asked students to watch a four minute video (WARNING: video highly graphic) that showed graphic images of farm animals being mistreated and slaughtered. Two volunteers for FARM advocated for the public education of animal abuse through grassroots activism. Students that watched the video were given $1 and wrote their first and last names on the video touch screen with their email address for follow up purposes. At the end of the video students were asked whether they would cease eating meat or animal-based products for a week or a month. The FARM presentation was set up on the American River College campus from 9 a.m. to 3 p.m.
Erica O’Neal, the co-operator of FARM, started to volunteer earlier this year. O’Neal had advised her family and friends to try out a vegan diet, however, she is not the only one that seemed to be swayed by the video’s message. ARC student Markel Bragg had strong opinions after watching the video. Another student, Keith Williams, commented on the difficulties of switching to a vegan lifestyle. “I grew up eating meat, but it’s a bit upsetting and a little sad cutting chicken heads and I was surprised by cutting pig testicals,” said Willaims. Todd Lee has been working for FARM for two years. Lee commented that possibly there could be an Animal Rights Club, but no further comments could be added to this statement. Lee and O’Neal are not ARC students but have stated that the program has been on campus in the past year. FARM has showed the video to several campuses across the nation dating back to May 2012. 1 Comment on "Farm Animal Rights Movement fostered feedback through a graphic video"
As someone who spent a month traveling on the 10 Billion Lives Tour showing students a video as to the reality of how animals are treated in the farm industry, I know how important it is to raise people’s awareness of how poorly animals are treated.